Then 1845 Historic Elgin/Cottrell House, aka, My Old Historic House. My Niece Linda adds a bow to the white pine garland that we made. We gathered the pine and I gave the girls a lesson in garland making. We used no electric lights in our decorations. I'm hoping to take you on a trip back in time, when Christmas was a rather new word. A time when the world was a much simpler place. A time when Children couldn't sleep at night, waiting for a simple treat, like an orange or a stick or two of peppermint,When children were very good and waited all year for a penny and a bright new toy. A doll that cost $1.50 and a wind up truck that cost a few cents. A time when families would travel for days to visit and stay for weeks.A time when people snuggled under goose down comforters and wore nap caps to bed ,to keep them warm. The 11 foot Christmas Tree in the Down River Parlor.Hand made paper ornaments and garlands of Ribbon Roses. Antique hand blown ornaments.No electric lights. In 1845 America,when My Old Historic House was started, very few people knew any thing about the celebration that we call Christmas. There were no Christmas trees or Santa Claus. 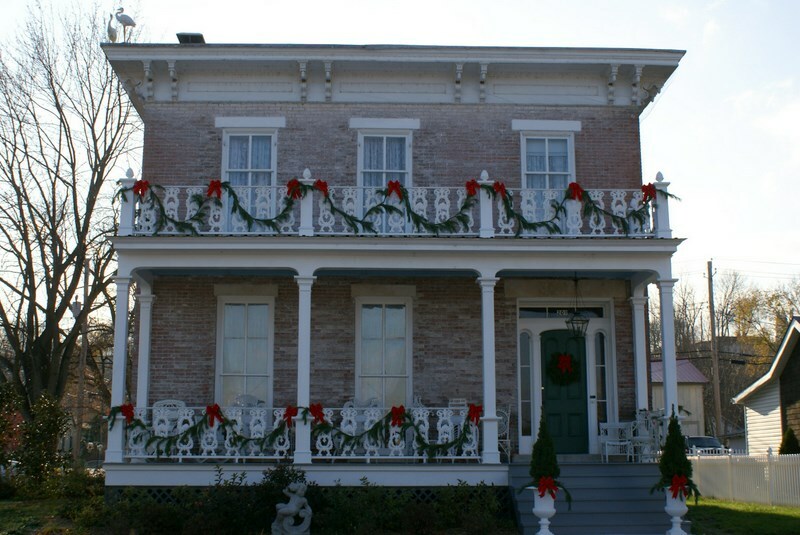 In 1860, when an addition was added to, My Old Historic House, Christmas and Santa had made it's way to America. The Christmas traditions were started in Germany and England. 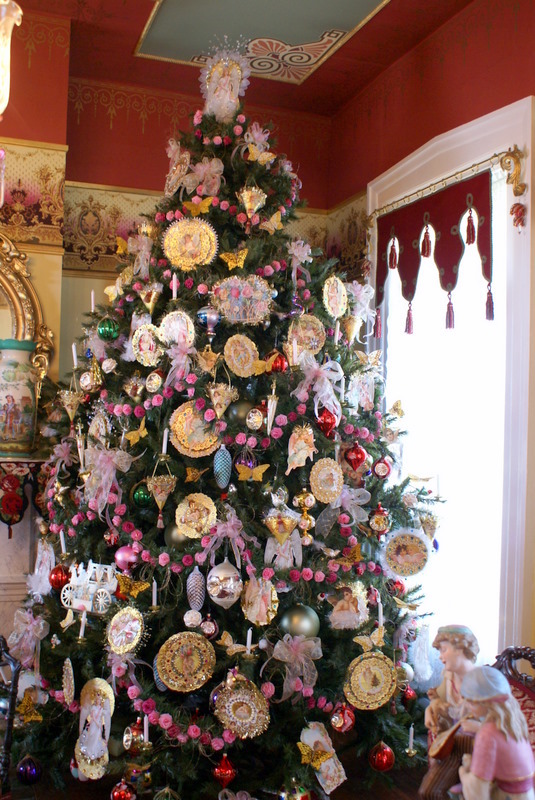 Queen Victoria's husband, Prince Albert, actually brought the Christmas Tree to England from Germany. When pictures of this tree were published, the tradition traveled to America. 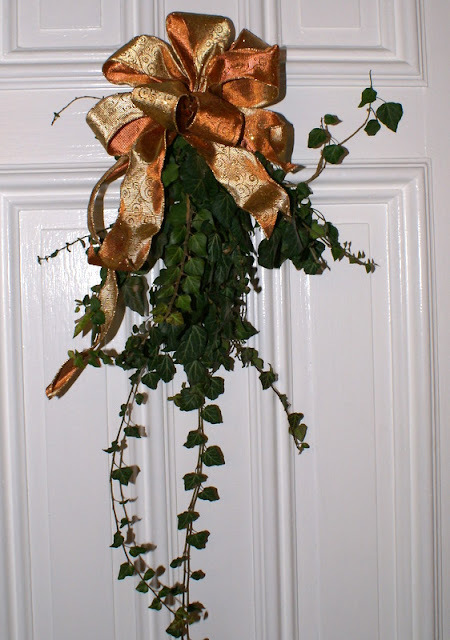 Very few people had store bought decorations. Most trees were ever greens that were cut from the woods. Decorations were mainly hand made. 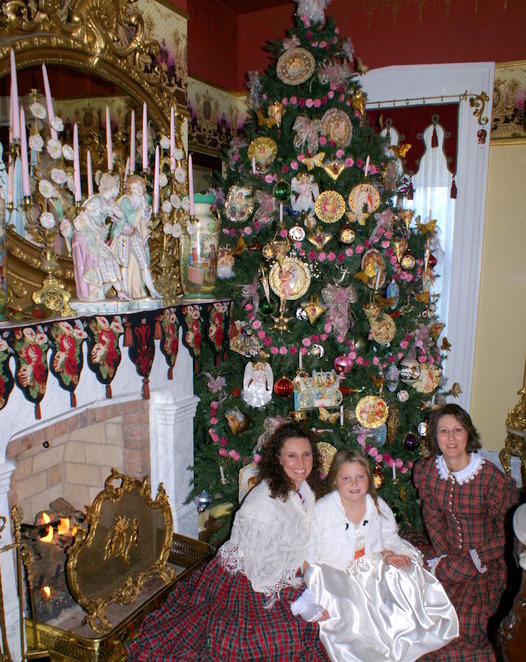 The Christmas card is a 19th century invention. Santa Clause was originally a religious figure, St. Nick. When the little children book, "The Night Before Christmas", was published, this made Santa ,a house hold name. We Americans gave him the name of Santa Claus and invented his traditional look. 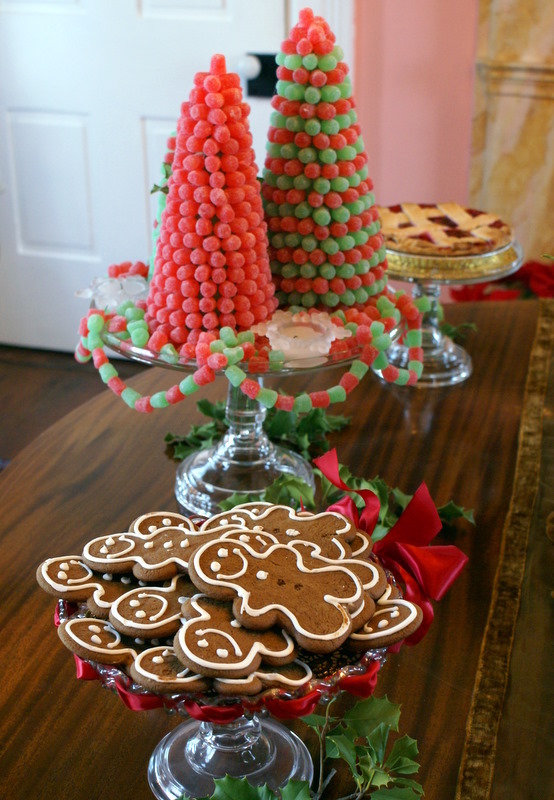 Trees made from Gum Drops , ginger bread men and Cranberry pie. 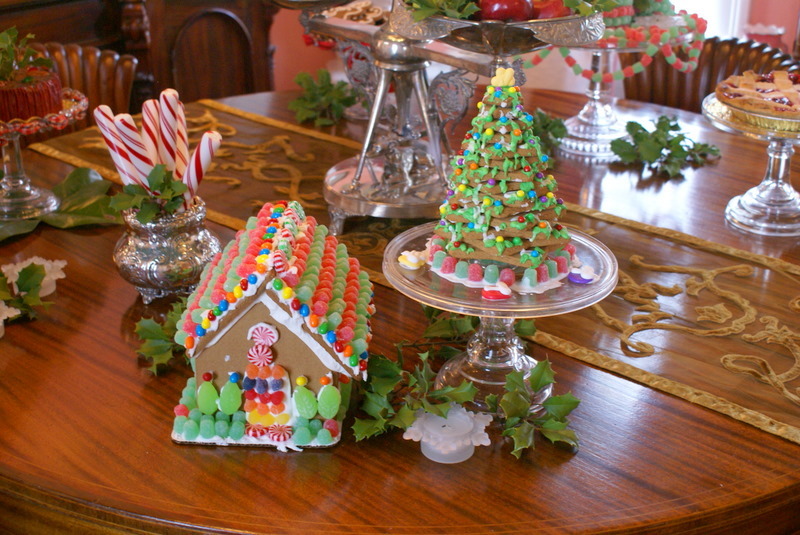 A ginger bread house and a cookie tree. 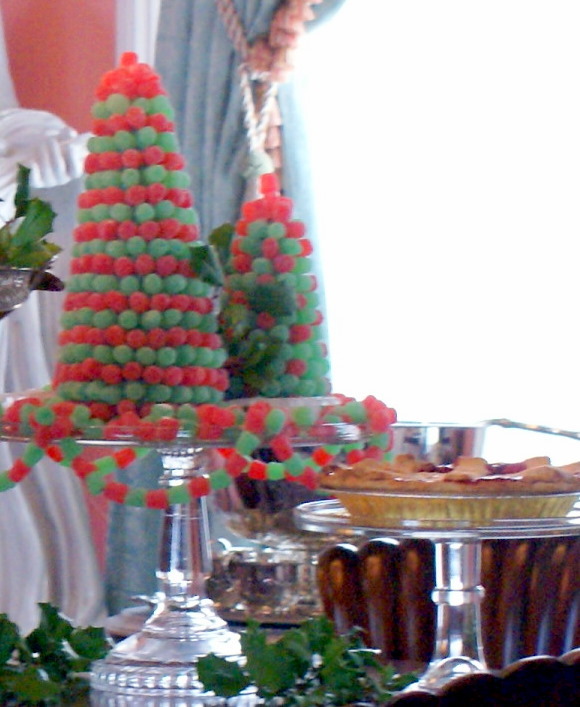 Gum Drop garland made by lacing a florist wire through the gum drops and they were hot glued to the cake plate. Store bought Christmas Tree ornaments are a 19th century thing. They were at first all made in Germany. Hand blown from glass into metal molds and decorated by hand. These were made in a cottage industry, and were soon being shipped all over the world.Electric lights were not used on Christmas trees till the 20th century. Most homes did not have them till the middle of that century. Candles were often used to light the Christmas Tree. This was very dangerous and they were only lite for a few minutes. Most homes kept a bucket of water close by, just in case of a fire. 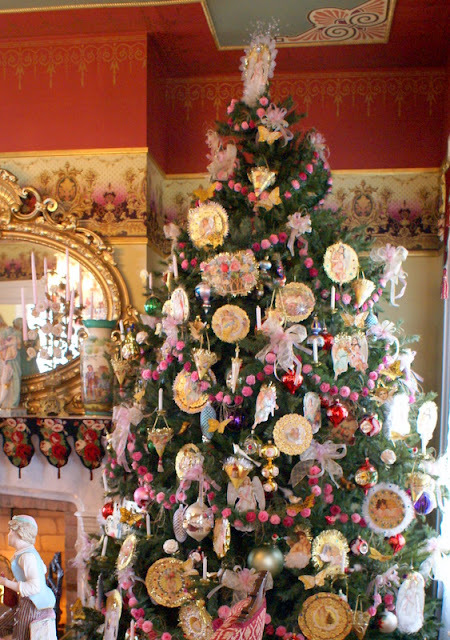 The traditional home would decorate the tree on Christmas Eve , after the children had gone to bed.What a surprise when the woke on Christmas morning. 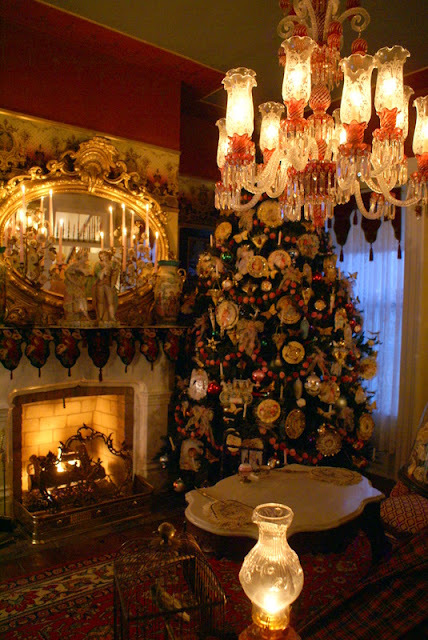 The first Christmas Trees in the American White House were not placed there until around 1921. 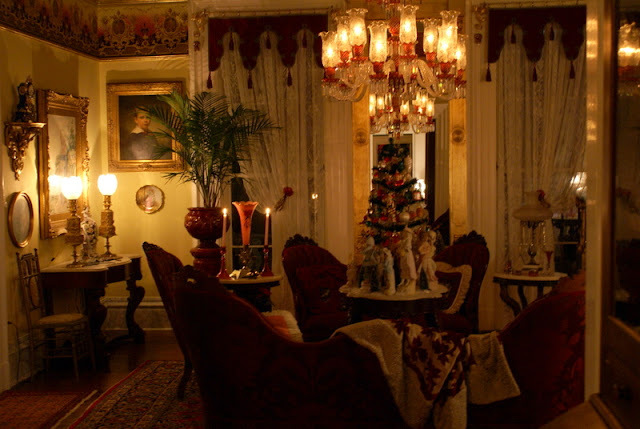 Christmas was made a national holiday in the in 1899.The date of December 25 was settled on at that time. The original Christmas meaning was to mark the Birth of the Christ Child. This is often over looked in world today.The Christmas present was to represent the gifts that the three Kings brought to the Christ Child. 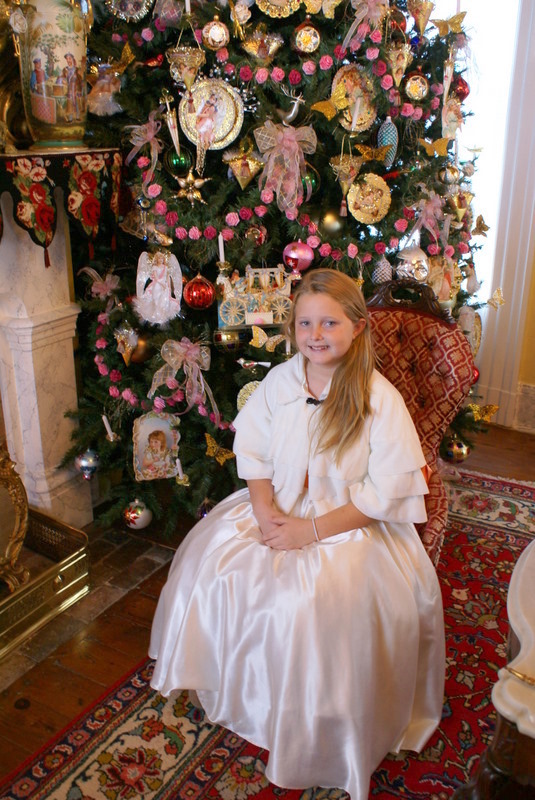 The Christmas Carol in Europe is many centuries old, but in America, it is mostly a 19th century inventions. Hand made ribbon roses were linked together to form a garland. Oh my how Christmas has changed. Today there is Black Friday and Cyber Monday, Trees are up before Halloween, people go into debt and Children get things that cost as much as some people have to live on.Bright, flashing lights are everywhere. 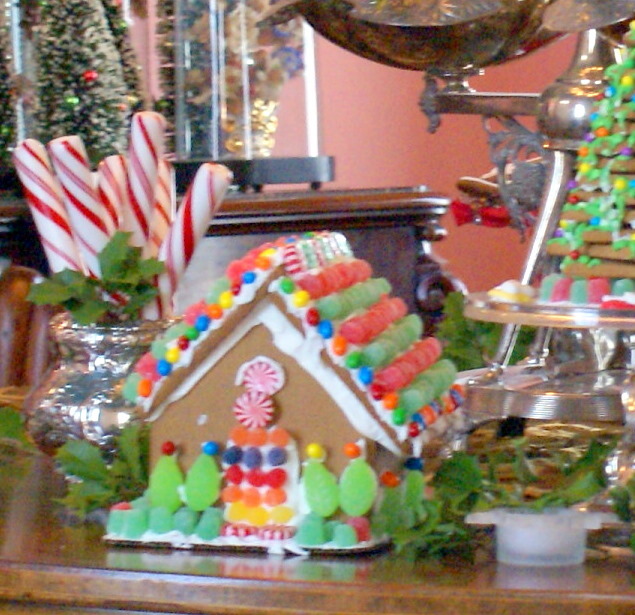 Some displays are so over the top, that ,"Christmas Toxin." is the way I can describe it. I guess all this is progress. But some how I long for the simpleness of the pass. I hope you all will stop and think about the Real meaning of this season. Take time to be thankful for what and who you have. Keep in mind, those who will do without and maybe be a little generous with the giving in that department. I am showing you today the Christmas decorations at, My Old Historic House. 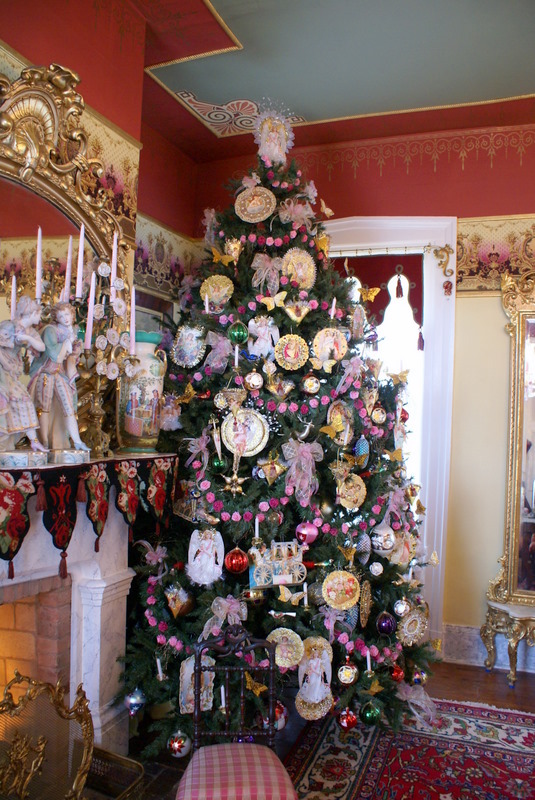 There is no flashing or twinkling lights.There is a 11 foot tree, loaded with hand made paper ornaments, ribbon rose garlands and some of those first, hand blown glass ornaments that made there way to America about the same time the house was built. I had my sweet Nieces and one Great Niece come and help. They chose to get dresses up in there Ante-Bellum Christmas gowns for the occasion. We had fun decorating the tree, making ginger bread men and houses.I had ribbon candy, orange slices, pecan pie, fruit cake and plum pudding , for treats. The dining room table was a feast to a little girls eyes. 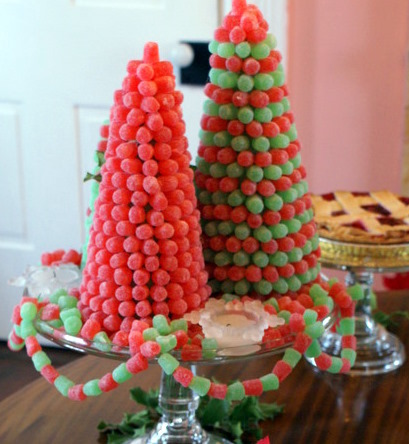 There were Christmas trees made from Gum Drops and goodies to eat. Candles were lite all over the house and we all stood back and admired our creations. My two nieces, Linda and Elizabeth and Elizabeth's daughter Patricia. She looks like a little girl from a former time. 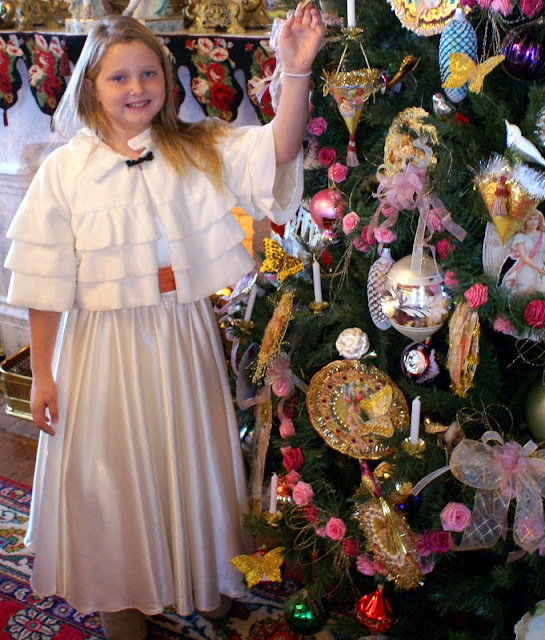 My Great Niece Patricia adds decorations to the tree. 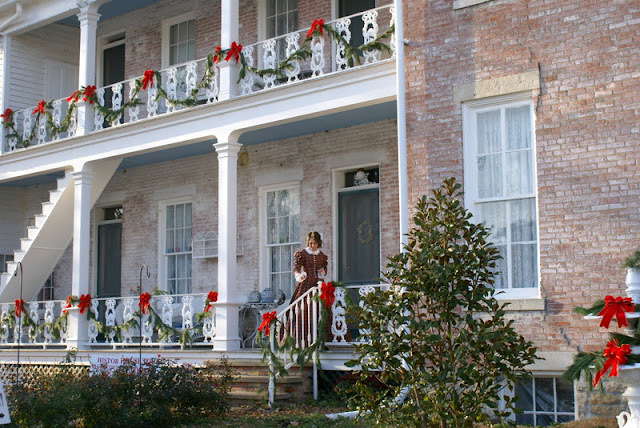 I sure wish you all could come and visit, My Old Historic House , for a Christmas Tour. I know this is a busy time and we all live far apart, but I'll take you on a tour today, by the 20th century invention, the computer. The Down River Parlor with a fire in the fireplace and all the candles aglow. 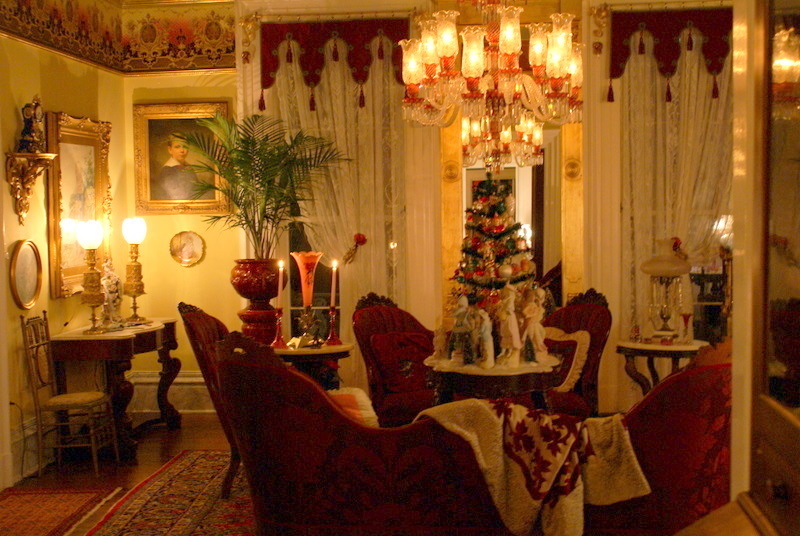 The Up River Parlor with a 20th century feather tree on the center table. A simple bunch of English Ivy from the garden with a pretty bow . 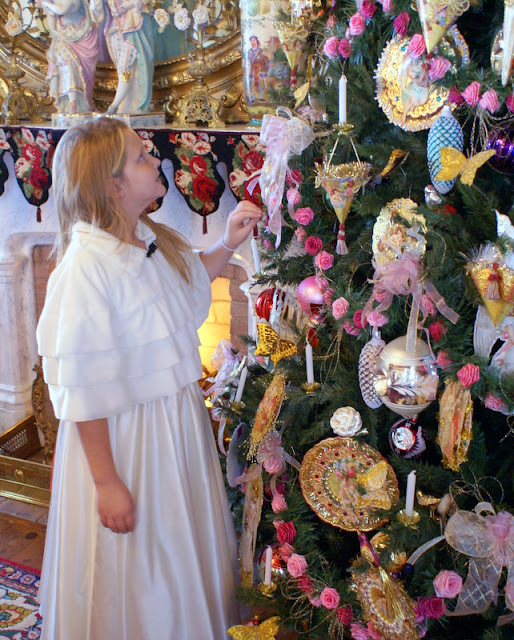 Hand made ribbon rose garlands, paper scrap ornaments, clip on candles , feathered butterflies and antique hand blown glass ornaments decorate the great tree in the Down River Parlor.